I’m back with another Paint Color Crush design! If you’re new here, just about every Friday I share a new design board incorporating a gorgeous paint color with some fun finds that I’ve come across as of late. Today’s PCC design serves two purposes – it’s all about the Fall Into The Holidays room of the week – bedrooms – and it’s also, at long, long, long last, the plan for my youngest kiddo’s room. 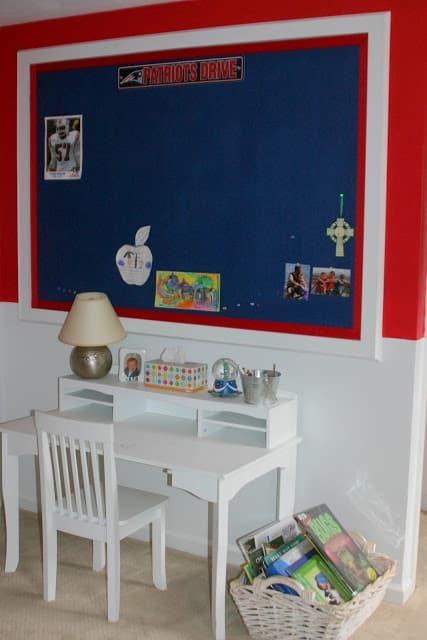 Seven years ago I painted Sean’s bedroom with a $3 can of “oops” paint from the clearance section at the hardware store, and even though it’s always been too bright, too tomato red, I just never got back around to painting over it. Okay and then there’s this – that itty bitty little desk? Sean’s fifteen. FIFTEEN. He’s a sophomore in high school. He is taller than both Mark and I. He shaves. Clearly I’m gonna have to let the kid grow up at some point! Since his brother’s room is black, and our bedroom is a dark blue, I tried to steer Sean towards a lighter wall color because seriously, how many moody bedrooms can you have in one house? 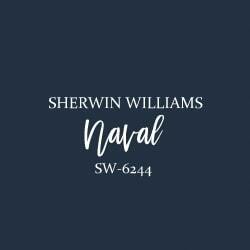 But Sean adamantly stuck with his wish for navy and I can’t blame him – we love our deep dark walls and clearly so does he because I find him lounging on our bed watching TV all the time. So here we go again with another teen boy’s room! 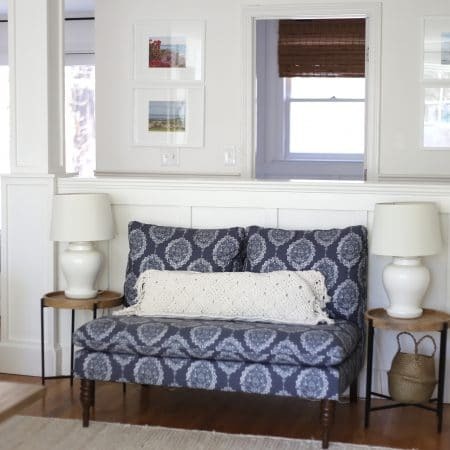 THE PAINT Sherwin Williams Naval is a great color match to the blue in the curtains. It’s a true navy without a strong green or purple undertone. 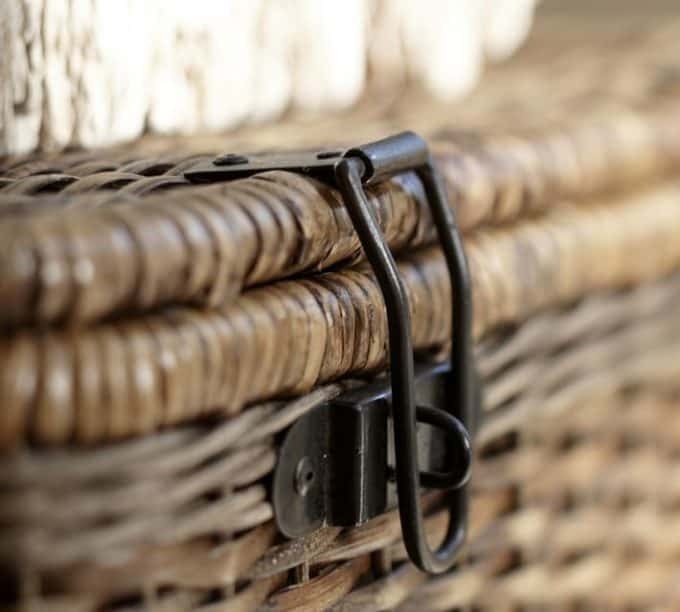 SAVE The lidded basket with metal detailing. I usually buy super cheap baskets at the Christmas Tree Shop but Sean badly needs shoe storage, so I need something that will take a daily beating. Pottery Barn is having a huge sale right now – up to 70% off some items, and all baskets are 20% off. Definitely a good time to pick up something you’ve had your eye on. 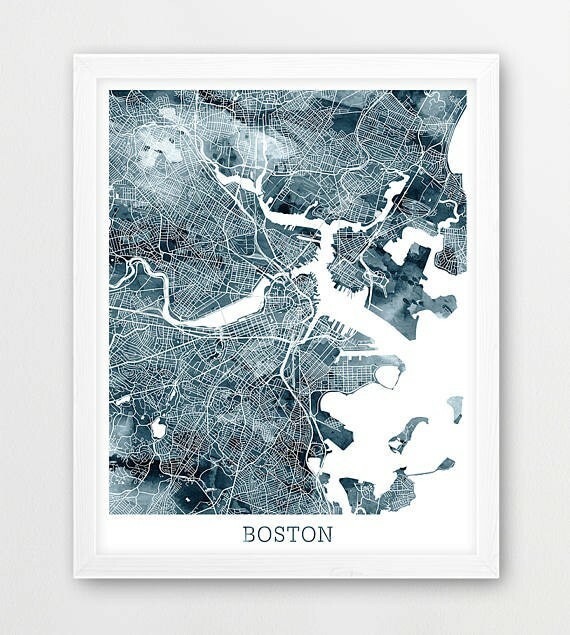 SAVE This city map is a super affordable digital file that you can have printed at Staples and frame for large scale, inexpensive art. DIY I’m planning to build a desk to replace the little preschool one under Sean’s bulletin board that will include a tilt-out hamper inspired by this tutorial at Sawdust 2 Stitches, since Sean’s room is tiny and there’s no good place for a laundry basket at the moment. 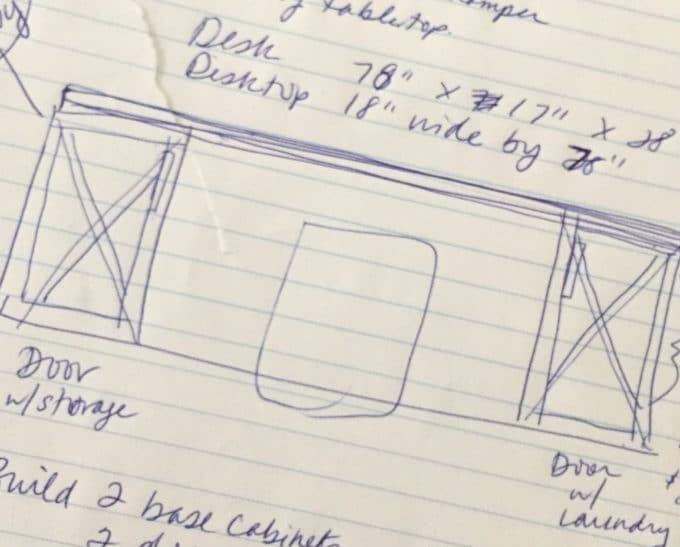 This is going to be a challenge for me because I’ve never built a cabinet and this design will have two! 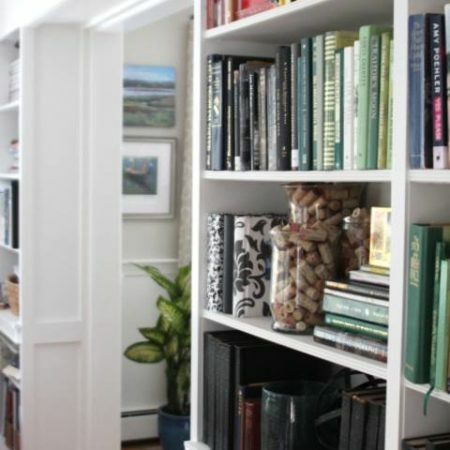 I’ll be following this tutorial by Ana White on how to build a base cabinet. FYI If you’re looking to get a little more time out of an older mattress like Sean’s (it pre-dates him!!) try a pillow top mattress pad like this one I have on our own bed. I found mine at Ocean State Job Lot (a local discount store) but eventually bought them for the kids on Amazon and they really do make a difference, especially with an older mattress. 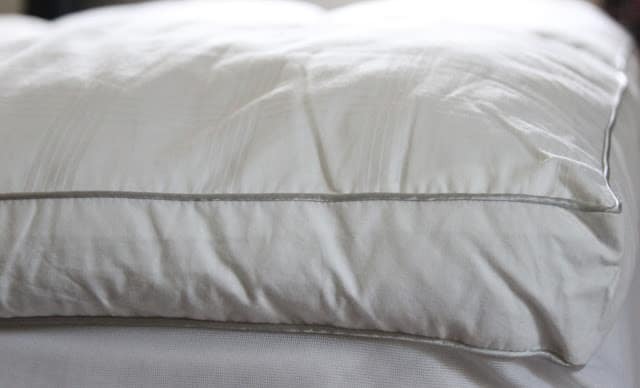 You might need deeper fitted sheets so take that into consideration too. For more bedroom spruce up ideas, visit the Fall Into The Holidays posts! Next week we’re talking about ideas to whip your living room into shape before Thanksgiving and Christmas!Wishing you a wonderful November weekend ahead my sweet friends. Thanks for visiting! See all the Paint Color Crush design boards here! The tiny desk makes me laugh…they really do outgrow things fast, don’t they? Love the color – Naval. I want to use it somewhere in my house one of these days. My son has the same striped duvet/shams. They have held up beautifully. Great inspiration, Lisa. Have a wonderful weekend! Oh the mother guilt with this room! I actually took the desk out a while back and now all his school stuff and lamp are just sitting on the floor! Poor kid. SO glad to hear that duvet and sham has held up!! I was wondering about that. The price is great! Oh my word, picturing him trying to sit at that desk cracks me up! 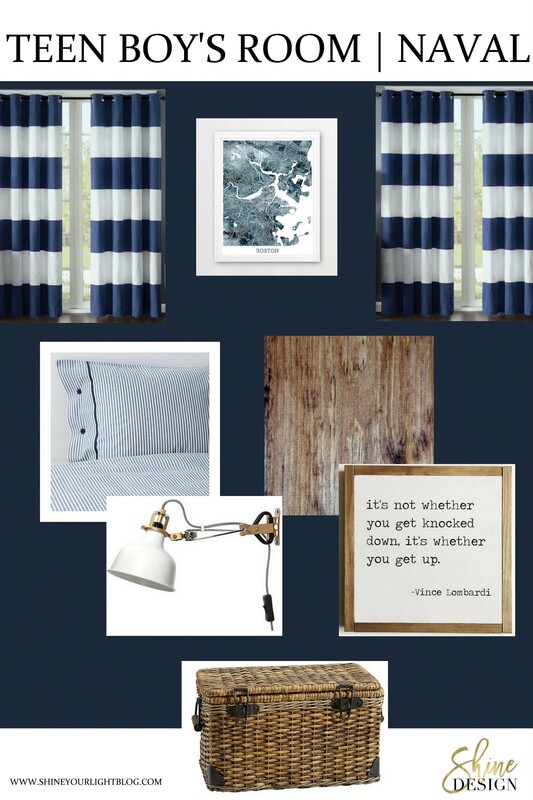 I love the design board you’ve created for his room. The paint color is so rich, and perfect for a young man. And he never even complained. He’s such a go with the flow kid! Yes I’m excited to see that paint on the wall, it’s going to be a vast improvement to the crazy neon red! Have a great weekend Lauren. We used Naval for an accent wall in my daughter’s otherwise white bedroom. Looks great. Oh pretty for a girl’s room with white walls! Don’t you love how versatile navy is? Absolutely love the plan you have for his bedroom! You’re so good with dark walls, why fight it 😀 It’s going to look amazing!! Our whole first floor is white, and then the upstairs is like a kaleidoscope of color and craziness! But we do love our dark walls around here! Want to see end result! Sounds great. We sid M’s room with Naval below chair rail and off white above. Big canvas from canvasfreaks.com and all is well. Keep showing us and leading the way!! Plus I crack up knowing S is 15!!?? Oh that’s so funny that you used Naval too Deidre! It’s a great color, I can’t wait to get it on Sean’s walls. I have to check out canvasfreaks!